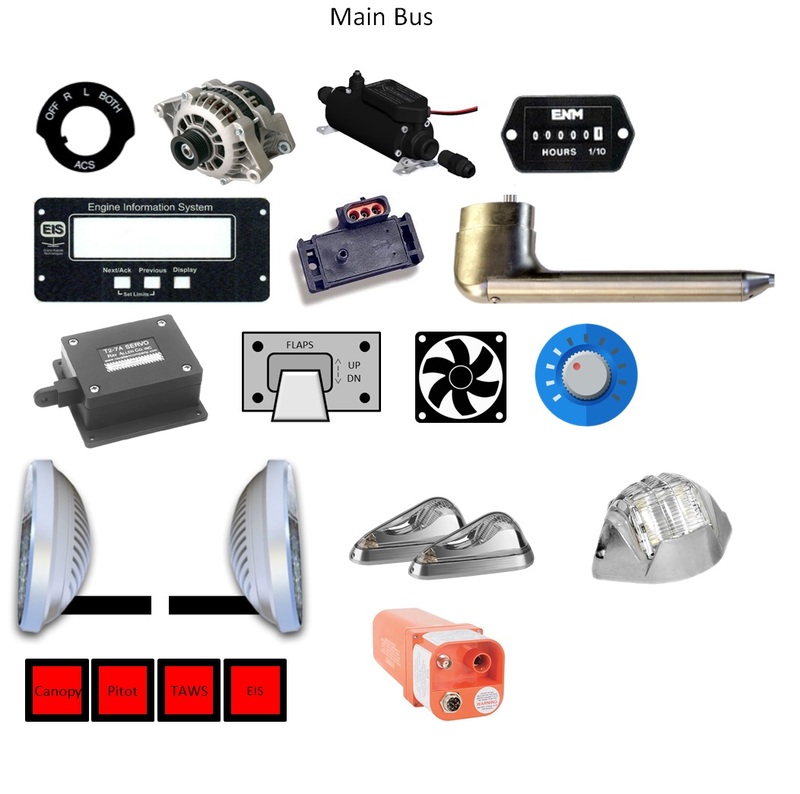 I offered much thought towards how I would setup the bus architecture in the aircraft. Here is what the system will look like at a high level. As noted above, I have decided on three buses. Left-to-right, Main, Avionics 1 and Avionics 2. Here is a list of the items on each bus. An asterisk, "*", indicates the device is additionally switchable. Update 13-Nov-18: A very minor change was made to the topology. 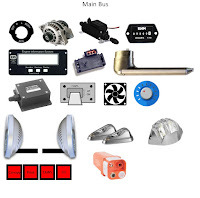 My thinking was to keep the Master bus for devices that typically need to always be on, including for engine start. Avionics 1 would be for devices I would want available should I lose my alternator and need to conserve energy as I look for a place to put down (the SkyRadar DX has an integrated AHRS that is accessible via Wi-Fi on my phone/table, the ADI-2 provides multiple pieces of flight info, as does the EFIS provides, including synthetic vision). 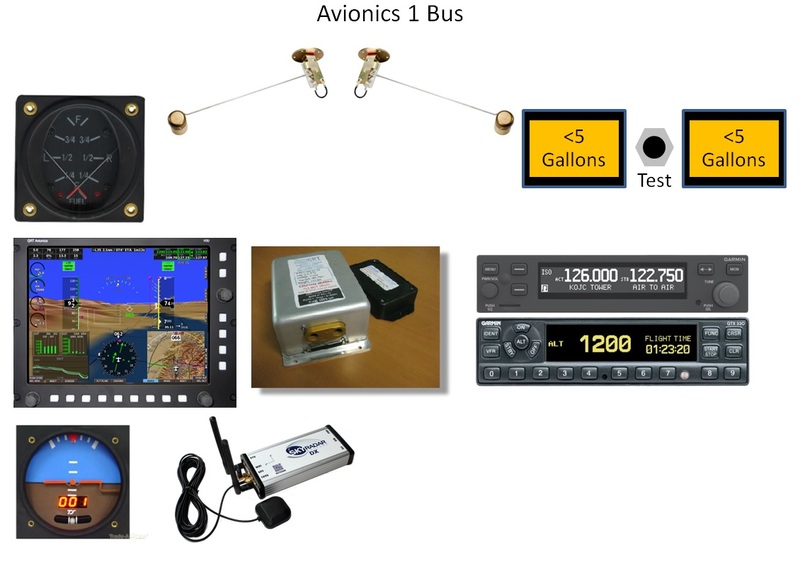 Avionics 2 would be for all remaining devices that are not necessary for VFR flight. At this point, I do not feel it necessary to place a backup battery in the system to power the Avionics 1 bus. Batteries very rarely fail catastrophically and I'm more concerned about an alternator failure. 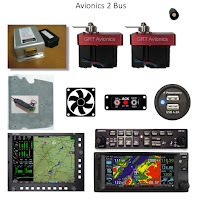 In a worst case scenario (no radio, no lights), I can reduce constant current consumption to under 5 Amps (no attitude indicator or backup AHRS) with both Avionics 1 and 2 busses off, or under 8 Amps with the Avionics 1 bus on. I will use the ES 24115 Master Relay (a Cole Hershey 24115, 85 A continuous duty SPST) supplied by Van's to provide power to all busses. Though the airframe will act as a heatsink, this gives a great safety margin. 0.28 V maximum output voltage drop. 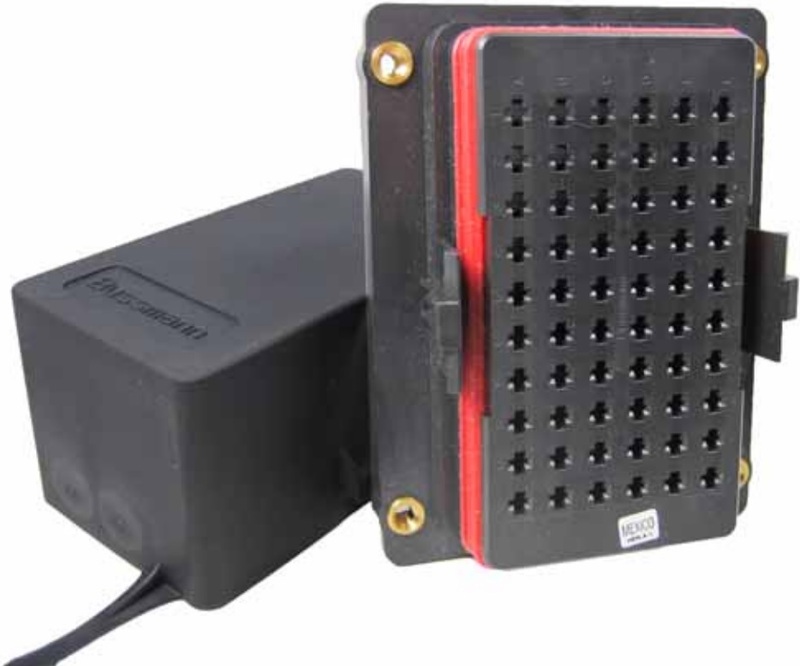 2.5 mA minimum load current. 0.1 mA maximum off-state leakage current of (irrelevant when Master is off). 4-32 V control voltage range. -40 to 100 °C operating temperature. The SSRs (left image) will each have a diode across their loads. This is to ensure that any inductive reactance in the load (i.e., my avionics, of which the autopilot servos are the greatest such contributors to inductive reactance) will be properly diode suppressed (right image) when the SSRs are turned off and will thus not fry the latter's trigger circuit (parts ES Diode Master and ES Diode Starter on page 43-04 serve the same purpose for the ES 24115 Master Relay and ES 24021 Starter Solenoid). Here is where you can learn about a "flyback diode" and Crydom also provides guidance. 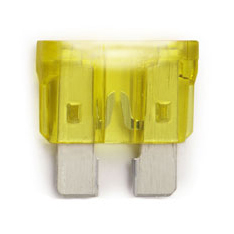 I will be using automotive ATM style blade fuses (available in values from 1 to 40 Amps). 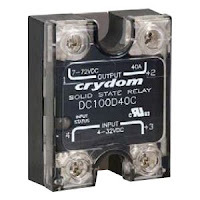 I have decided against circuit breakers because if a circuit exceeds its designed current, I wouldn't want to reset it in flight before investigating the issue on the ground. Blade fuses can be found with an integrated LED that illuminates should the fuse blow (ATO style here). The LED is self-limiting as, should itself fail, it fails into an open circuit. Thus, I will need a fuse block. I wanted every device on its own fuse, so I will need at least 40 positions available, preferably more to accommodate future expansion. I decided on the Cooper-Bussmann 15310-1-2. It support 30 fuses and is non-bused. So a daisy chain of wires mates adjacent fuses to create buses (being careful to avoid exceeding current capacity). I will dispense with its oversized cover (the 15310-1-1 has a smaller cover but I am unable to find a supplier that sells it in single unit quantities) or trim it to a shallower size. With a footprint of approximately 2.42"x4.17", it will easily fit into the ~3.9"x5.3" space in the F-14106 Wiring Channel after cutting a mounting panel for the purpose. The block uses TE Connectivity 1-968855-1 (16-20 AWG) and 1-968857-1 (12-14 AWG) terminals as well as Tyco AMP MCP2.8 Series #828922-1 cavity plugs. A ground block is important to reduce the possibility of pesky ground loops, which tend to introduce noise into the audio system. Whilst the "forest of tabs" approach is well proven, I wanted the additional stability of screw terminals (which can back out over time, so their torques will have to be verified at each annual inspection - nothing's perfect). I chose this block from Fastronix. 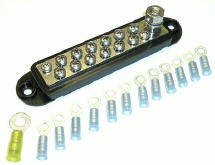 It has a single binding post with 12 positions for ground terminals. Averages: 495.86 hrs/yr, 41.95 hrs/mo, 1.36 hrs/day (from start). Hours/day worked: 3.51. Hover your mouse over most categories for itemization. Install on original & replacement tanks. Mounting - 1, 2, 3, 4, 5, 6 & 7. AveoMaxx Hercules 30 landing lights. Low fuel level optical sensors. USB power for canopy cameras. The current version of my panel. 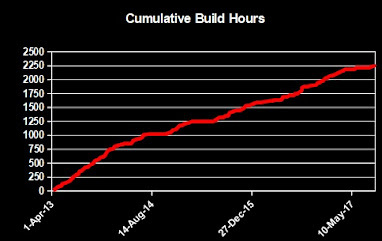 Cumulative hours on the build vs. time. Starting to look like an airplane. The first time it came to life. You just can't beat the intersection of performance and price with many homebuilts. 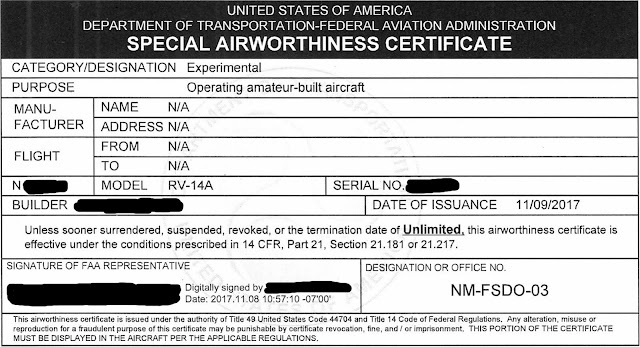 Given my "mission profile", the RV-14 seems to have it all: Best bang-for-the-buck, good compromise between cross country and aerobatics (I don't plan on doing the latter, but the added structural integrity is comforting), can design your own avionics setup, plus you get your own repairman's certificate. I have no relevant experience or special skills relating to such an endeavor. My mean paper airplane folding abilities seem not to apply. If I can build an RV-14A, almost anyone can. The experience has so far humbled, schooled, rewarded and penalized me. There have been days I've wanted to sell it all for scrap and others when I wanted to build every waking hour. It has challenged my finances, expanded my appreciation of aeronautical engineering, forever changed the way I look at aircraft and found me many new wonderful friends. When this airplane finally takes its first flight, it will be quite a personal feat and the start of a whole new chapter. 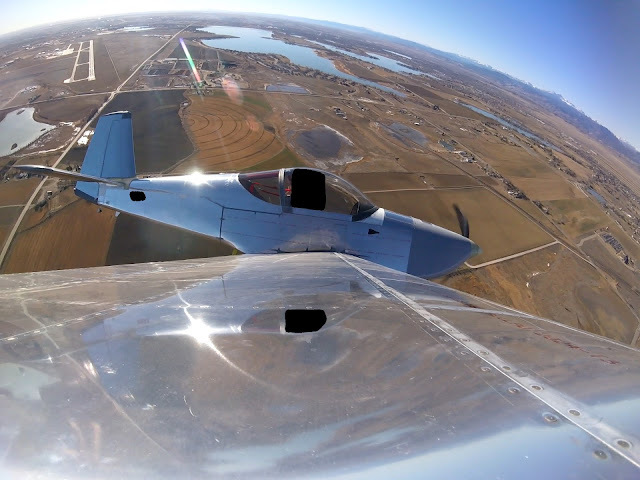 My vision for this blog is to be the kind of blog I would want to read if I were building the RV-14A. To that end, I endeavor to provide high quality images of the process, explain my approaches to building, accurately disclose my mistakes, itemize all costs and reference sources for materials and information. It is my hope that this blog is useful to others. If you find it to be, please drop me a line using the "Contact Form" above. I enjoy hearing from fellow builders and aim to respond to everyone. Please alert me to errors. This list is based on part numbers. I'm offering this blog to provide others insight into my experience and for my own historical purposes. Airplane construction is a serious affair. I have no authoritative skills relating to airplane construction (in fact, I lack skills in anything, really). As such, any use of the information contained on this blog is at your own risk. Direct link to this table. As counted from the plans by me. Prone to errors. No copyright claimed. Content is for public domain. If used, please attribute properly. Simple theme. Powered by Blogger.